Funny. It seems almost like a couple of years ago I first saw the Dillards at the first Monterey Folk Festival back in May, 1963. Rodney and Doug Dillard, along with Mitch Jayne and Dean Webb, clad in fringed buckskin outfits, straight from the Ozarks, playing great shows with sparkling banjo solos from Douglas. Well, here we are in the next millenium, and I thought all those guys were dead! But no, they’re back, having a great time on a reunion tour, allbeit without Mitch or Dean. They played the Songtree series last night, and it gave me a chance to catch up on old times with guys I hadn’t seen since the 70s. You can see Doug with his banjer and Rodney on the guitar (Rodney was always one of my very favorite rhythm players – really rock solid and great bass runs). 2 Responses to The Dillards Play Goleta! Thanks Regina. Somewhere, I have photos I took of the Dillards back in 1963. If I ever find the right cardboard box, I’ll publish one or two. 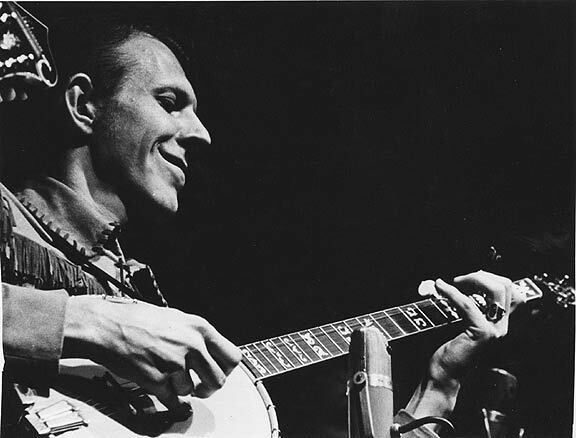 Matter of fact, here’s a snap of Doug Dillard, onstage at the Monterey Folk Festival in May, 1963. This was the first time the Dillards made it out to Sunny California, complete with buckskin jackets and fringe.